Exceptionally pretty old cottage in the heart of Chianti just 10 minutes walking from the medieval town of Panzano. Completly restored on two floors, very peaceful and exclusive with beautiful views on the Chianti valley.Downstairs: there is large livingroom with wide windows on the Greve valley,a nice dining room and well equiped kitchen,a cosy single room with bathroom with shower and a nice big bathroom with old turkish sinks and tub.Upstairs:a double bed room with tipical tuscan windows"a mandorleto",wood floor and ensuite little bathroom with shower;a confortable room with two single beds that can turn up in a double bed if request always with tipical tuscan Windows and wood floor. All the house is air-conditioned. Outside there is a nice pergola with a big table to enjoy cool dinners when the weather is hot or breakfast-lunch looking at the olive trees and wineyards just beyond the beautiful Villa of VignaMaggio.No ending swimmingpool at exclusive use of the guests with a beautiful view on the Greve valley. 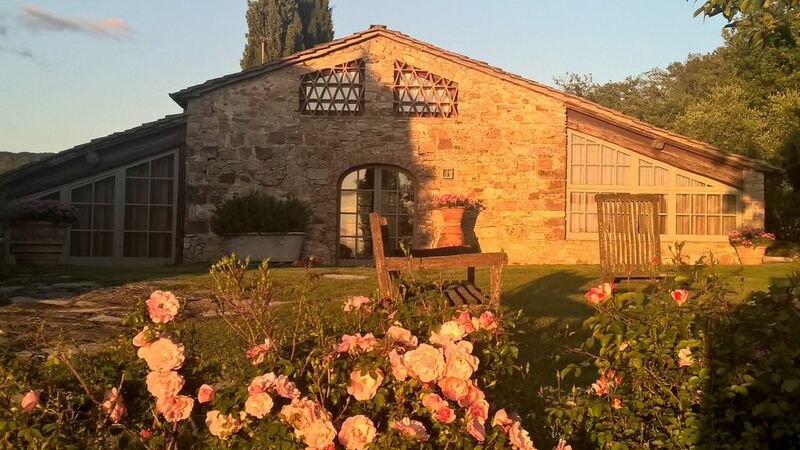 My husband and I and our two friends stayed in this amazing villa in the heart of Tuscany. The villa was spacious and looks over a beautiful valley. Lucrezia was a gracious and attentive host. She had a basket of goodies and wine for us when we arrived. Everything was neat and clean. The private pool was surrounded by flowers and the views were amazing! The owner checked in on us about once a day to make sure we had everything we needed. We would definitely come back to this relaxing place again! We stayed at Lucrezia’s house for a week. We traveled to Greve, Florence, Montalcino, Lucca and Livorno. The villa is fantastic. We had plenty of room for 5, six would have worked. Unbelievable views, sunsets, daydreaming!!! Lucrezia is a wonderful host!! We visited multiple wineries, shopped for leather goods in Florence and had the time of our lives. I would highly recommend. 5+ stars!! Our family thoroughly enjoyed our stay at Lucrezia's beautiful house in the hills outside of Panzano. The views are spectacular whether you are sitting by the pool, on the patio or in the living room. Our weather was perfect. The house is comfortable and charming - a bit creaky at night - but that just adds to its charm, as it is a converted barn. Three bedrooms and 3 full baths worked perfectly for our family of 5 adults. The location is close enough to town to walk and enjoy dinner, drinks or gelato. We took several day trips - Siena, Volpaia and Greve. We would love to return for another visit. Thank you for a perfect Tuscan holiday! The property was beautiful and the location is perfect. Lucrezia was wonderful. We loved Napoleoni and Nelson. Lucrezia was a fantastic host! The property was a little difficult to find initially (Google maps was not correct), but Lucrezia helped us find the way. She provided us with a welcome basket to get our holiday started. The views from the house are spectacular. The outdoor sitting area with pergola was a lovely place to enjoy morning coffee and the sitting room was perfect to look out upon the view. Day trips to Florence and Sienna were easily managed. Being in the Tuscan hills, they roads are quite curvy, but for us that added to the fun. The house is walkable to Panzano if you care for a bit of a stroll. Delicious food everywhere. Cooking lessons can be organize at home on in the near village of Panzano.